Discover how a Zwilling J A Henckels Knife can help your cooking be more fun. Would you be interested in some background information about the Zwilling J A Henckels Knife company, and the innovative features their kitchen knives offer that can help make your cooking easier? These superb knives were first manufactured in the cutlery capital of the world – Solingen, Germany, in 1731. Thanks to 270 years of innovative craftsmanship, the Zwilling J A Henckels knife has a distinguished reputation, and won awards of excellence in the World’s Fairs of 1851, 1893 and 1915. 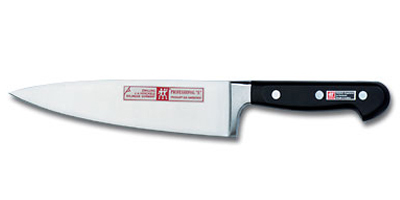 In 1939, the Zwilling J A Henckels knife company received a patent for the innovative Friodur® ice-hardening process. With this process their knife blades, made of a special steel formula, are quenched to below freezing temperatures during the heat treating process, resulting in superior blades. In 1992, the Zwilling J A Henckels knife company introduced Sintermetal Technology. With this technology, while the blade, bolster, and tang sections of the knife are made of different alloys, the sections are fused together into one solid piece, which allows them to work in perfect balance with one another. And to make chefs on any budget happy, a number of different Zwilling J A Henckels knife lines are available at different price ranges. The TWIN Grip, TWIN Gourmet, and TWIN Pollux knives are affordable knives with the company's Friodur® treated stainless blades, no bolsters, and they're carefully sharpened with a laser monitored process. TWIN Grip handles are designed for comfort. They are dishwasher safe, and there are no rivets. TWIN Gourmet handles are classically shaped, with rivets, and dishwasher safe. TWIN Pollux handles are ergonomically shaped, with rivets, and dishwasher safe. 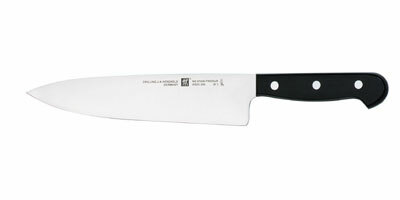 These are premium grade German made kitchen knives, more affordable thanks to simpler design features. Four Star knives are professional grade knives in classic designs made with Zwilling J A Henckels' Sintermetal Technology. And sharpened with a laser monitored procedure that ensures a sharp, flawless cutting edge. And the comfortable, classically shaped synthetic handle is unbreakable, resistant to acids, dishwasher safe, and perfectly fitted on the tang without rivets. These durable, premium knives are available in a variety of kitchen models that are sure to increase the pride you feel about the meals you prepare. Professional chefs provided guidance during the devolopment of the Five Star series, and these professional grade knives are available in a variety of styles and models that will handle any kitchen task. These knives have a metal bolster, are made with sintermetal technology, and the sharpening of the Friodur® treated blades is laser monitored. The modern, ergonomic, synthetic handles were designed by the Fraunhofer Institute, and are dishwasher safe, tough, comfortable, and easy to handle during hard work. 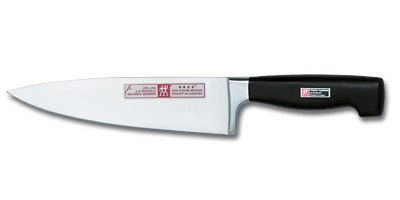 These are dishwasher safe professional grade kitchen knives made in the classic style. The tang of the handle is exposed, and the synthetic handle scales are secured with three rivets. The stainless blades are Friodur® treated, sharpened with a laser monitored process, and have metal bolsters. If you are a traditional perfectionist looking for the very best knives made in the classic style, to add to your enjoyment of cooking, and maybe add a bit of 'Professionalism' to the personality of your kitchen, Zwilling J A Henckels' PROFESSIONAL "S" knives will definitely warm your heart. These professional grade knives offer beautiful modern, stainless handles designed by the Fraunhofer Institute, and are as comfortable and easy to use as a knife can possibly be. TWIN select knives have a metal bolster, are made with sintermetal technology, and the sharpening of the Friodur® treated blades is laser monitored. This J A Henckels Knife will add a beautiful accent to any kitchen, and will help you finish your meal preparations more quickly. For more than 250 years the Zwilling J A Henckels knife company has been specifically dedicated to making the finest kitchen knives possible, and there's no doubt that a close inspection of their knives will impress you. They're beautiful, comfortable to use, made to handle any kitchen chore, hold a superior edge; and every J A Henckels Knife is built to last a lifetime. You might enjoy taking a look at the Zwilling J. A. Henckels Knives available for sale in our on-line German Knife Shop. Return from Zwilling J A Henckels Knife to the German Knife .com home page.